How are you? Hoje eu falo sobre a estrutura “self-stirring” em inglês. Não perca! Alright, so let me show you something – and if you’re just hearing my voice and not looking at the episode page at Inglês Online, you can head over there and check out this photo I’m going to talk about. This is a photo of a self-stirring mug. So, I found this product in a shop here in London and this shop is just full of novelty products. It’s got all kinds of funny, interesting and unique products and sometimes they come up with some pretty useful stuff. Yes, I’m talking about this self-stirring mug. What is that? It’s a mug that stirs itself. So, let’s break this down: say it’s 3PM and you feel you need that boost of energy only instant coffee can give you. You head over to the kitchen, grab a mug, put in a spoonful of Nescafe or whatever brand of coffee you prefer, pour some boiling water and sugar in the mug and then you use a spoon to stir the water and everything in it. 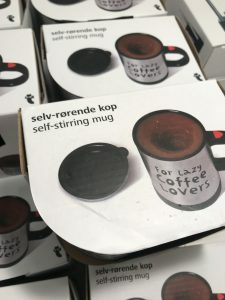 So, there you go: with a self-stirring mug, you don’t have to worry after adding in all your ingredients – it will give your beverage the perfect stir and all you have to do is enjoy it. Ok, so what is a self-stirring mug? It’s a mug that stirs itself. Probably at the press of a button, this little mug will stir itself. It’s a self-stirring mug. Notice that this is a perfect example of a sentence structure that can’t be literally translated word by word into Portuguese. Have you heard of self-cleaning ovens? What are they? A self-cleaning oven is an oven that cleans itself. I’d love to have self-washing clothes and a self-cleaning home but apparently we’re not there yet. So, let’s hear the structure again: self-washing clothes would be clothes that wash themselves. A self-cleaning home would be a home that cleans itself. You wouldn’t need to, you know, dust the furniture, sweep the floor, do the dishes – I mean, can you imagine? A self-cleaning home would clean itself. I mean, imagine how much free time you would have to do other stuff. Now here’s one that is pretty common everywhere: self-locking doors. If you got one of those at home, especially if it’s the main entrance to your place, chances are you’ve locked yourself out at least once. How would that happen? Well, a self-locking door will lock itself behind you, right? As soon as it shuts behind you – that’s it. It’s locked. The locking system doesn’t require you to insert a key and turn the key and so on. Nope, it will lock itself upon shutting. So, you if you forgot to take the keys with you and the door locked itself, that means you’re locked out and you’ll need to call a locksmith to get that door open. Have you ever locked yourself out because you forgot to get the keys, and the door locked itself? Let me know in the comments! See you soon.